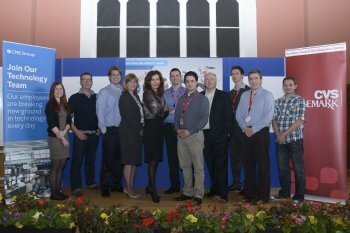 Hundreds of students flocked to the University of Ulster’s IT, Business and Finance Fair at the Magee campus this week. Employers from all over Ireland, including two new nearshore companies, CVS Caremark and CME Technology Services, offered graduate opportunities to final year students. Organised by the University’s Careers Development Centre, the Fair also provided information on postgraduate courses, volunteering and placement opportunities. Moira McCarthy, Career Development Manager at Magee, said: “The University of Ulster has a long tradition of working closely with employers and we invest heavily in the development of key employability skills for our students. “Despite the current economic downturn there are a significant number of graduate opportunities available throughout Northern Ireland. IT graduates are in particular demand, and this is a trend that is set to continue. Professor Deirdre Heenan, Provost of Magee and Coleraine and Pro Vice Chancellor for Communication, said: “The University of Ulster puts employability at the heart of the student experience. On average there are over 60 applicants for every graduate job, so employers are placing more emphasis on recruiting graduates who not only have a degree but who are also equipped with key transferable employability skills.